That's so funny, "Lets make the CPC Great Again", but it must be 64k, no multiloads, oh and it has to be written in BASIC 1.0. Hint: next year's slogan should say "PLOT -2,-2,1 Rulez"
For people who don't like the rules it is simple: Do not enter the competition! EDIT: That would be good. If people want to use plus and more ram this competition doesn't stop you. Why did you not release something already? - give students a chance to learn that making games is always about restrictions in terms of cpu, gpu, libraries, ram etc. Your 464 can be expanded since 80s. So, you can expect to use 128K games on your nice computer too. Exactly! And, I think that like movies festivals they should be "out of category" instead. That would be a nice category, like the demo "Wild" category. EDIT Oh and it gives more games to cpc. No argument with that. Though there should be no harm in answering folks queries if clarification is necessary. If people want to use plus and more ram this competition doesn't stop you. There seems to be some news conflicting the use of more RAM, but a game with Tune in the extra memory would still work on a 64k system - it just means no tune for 64k systems, if that's an exception. Why did you not release something already? It seems to have already been released, though it's still a WIP, might end up with two versions of the game. However it is not clear to me wether doing a WIP thread is ok with the rules? Last year I did a dev thread and it was OK. The game can't be publicly released until the contest is over, but other than that AFAIK you can talk about the game and share screenshots/videos. Released The Return of Traxtor, Golden Tail, Magica and The Dawn of Kernel for the CPC. If you like my games and want to show some appreciation, you can always buy me a coffee. I wish more expanded games were released, taking advantage of newer technologies and whatnot. That's my personal view. However, come on guys, we've have that discussion quite a few times in the past... Not that I find anything wrong with repeating points. But I think that the why's are properly explained here so there's not much room. So, please, refrain from discussing the rules -they are what they are. Of course by "refrain from discussing" I mean "don't do it here" - if you want, feel free to open another thread. Let's keep this one focused on more relevant questions and points, shall we? The rules state that the game must run on an unexpanded CPC464. I was puzzled that "expansion" included a joystick Y-cable (to connect 2 joysticks). That's not an expansion in my book. Well, certainly, a Y-cable for 2 joysticks is not a expansion, as it is not connected to the expansion bus. However, you have to consider that your game must be playable by the judges and has to be tested on real hardware to be validated: we cannot possible have any "accessory" that contestants may want to use. For instance, someone may want to make a game for AMX mouse (which connects to joystick port). That's a reason for not considering accesories. However, they are not banned: as long as your game is playable without expansions, there is no problem. If it also can manage expansions, that's considered an extra feature. In fact, judges stated a great consideration for your 4-player idea . Also, having same hardware for everybody helps comparing games in a fair way. There is one thing though. I think maybe every entrant should receive a copy of the tape. This is really difficult to achieve and, if you think of it, it does not make sense from the point of view of the sustainability of the contest. Since the start, we have been thinking of ways in which the contest could become self-sustainable. Casetes are the first open way for that. The money that comes from selling the casetes is enough to pay 1 of the prizes (125€ - 150€) once you discount all the costs. Of course, supposing that all the production is sold (which does not happen). So, if we give 1 casete to each participant, a great part of the sales vanishes, and we also have another cost. I personally would love to give all participants a copy of the casete. However, we first need to think of better ways to achieve self-sustainability. And, for me, the most important part is expanding the boundaries of CPC homebrew scene: it would be nice to have more players interested in buying Amstrad-related stuff. If productions were able to sell ~1000 copies, that would really start to qualify for self-sustainability. Then we could think of gratifying all participants with a free copy, instead of asking them to collaborate by buying their copies. All I'm saying is, it wouldn't hurt to have an extra category. Well, it might not hurt you, but it is not as easy as adding it to the rules. Categories include costs like evaluating them, which is not trivial (jury invests time), or paying prizes (which is not easy when you have to do it according to many hundreds of laws). There is also a fragmentation cost: 36 contestants in 2 categories are really great, 36 in 4 categories is less great (8.5 per category, less competition), and a educational cost (do I have to say to my students that their games should go in the 2nd Category?). In the end, it's a very difficult and risky decission from the point of view of the contest. There are also many questions, are the majority of the potential contestants wanting such a category, or are they only 4/5 sceners? Is more important to focus categories from the point of view of contestants, students, or general players? Will such a change be actually beneficial for the contest in the long run, or will it be an additional effort only to cover a concrete group of potential participants? Will that productions encourage new people to produce games, or will they be discouraged? It is easy to argue in favor of the things we personally want, but it is extremelly difficult to take decissions that affect everyone and have some certainty that they will be for good in the long run. Please, either the case, take into account that we consider your opinions, but it is impossible to put all opinions into practice. However, regarding 128K and more, my personal suggestion is this: consider the contest as an oportunity to test your ideas. Testing your ideas should always start small, and grow as they show potential. If you think of a maravellous 512K game, why not to develop a small part of it in 64K, test it in the contest (against jury and public) and then consider the 512K version with respect to results got from the test? As @reidrac has already said, it is valid. However, you should be cautious not to put your game in risk of being disqualified by judges. The rule states that your game has to be unpublished. A development thread with some data about your game and some screenshots it is normally okay. However, if you go releasing demos or betas, you may put yourself into risk. Judges may consider that you have already published your game, and may disqualify you. When I say this, I'm only warning about this possibility: I'm not part of the jury, so I cannot be 100% sure what their final criteria will be. However, I prefer a warning than a posterior complaint, be it reasonable or not. As I prefer all of you to enjoy the contest and to see your games competing, I advice you not to do things that may be dependant on a supposed certain type of criteria. Also, think about the surprise effect. The less people know about your game, the great the surprise. A good balance into giving people bits of your development process and keeping surprising parts is always a good policy . For some reason I thought @ervin had a whole heap of stuff for RUN"CPC on the board, and that got into the contest just fine. Though I think @ervin only released so much of it on the Forum. @AMSDOS , yes, @ervin published some early demos of his work in his dev thread. That, in fact, put his work into risk of being disqualified. I also adviced him to stop publishing demos. The jury discussed his work and decided that the game itself had not been published as it was much more elaborated than the early demos published. However, the jury had to discuss about it. Therefore, it's preferably not to put jury under pressure: that's a risk for your work and even for the contest itself. I'm looking forward to more quality games for my totally-unexpanded 464. Frogalot was one of my personal fave games of last year on any format. I don't know whether to start work on a new game or just enter the one i've nearly finished. I can't think of anything good I can do in the time frame but I don't think my current game is good enough to make the top 3. Although its certainly better than Concave. @EgoTrip , if you are talking about "A Prelude to Chaos", you actually shouldn't submit it. You have already published it, and the jury will certainly disqualify your entry, as games should be new work, not previously published (it's in the rules). Well, the jury rules also tell not to use previously used stuff. But the winner was in the opinion of many users here an "Army Move" Rip-Off. Personally I don't want to comment on that. But the the reputation of a jury suffers if this issues pop up. Maybe this can be made better the next time. I provided feedback regarding rules that in my humble opinion are not completely clear, and I hope I did it in a reasonable and respectful way, but your comment is distracting and won't help to improve anything. I'd like CPCRetroDev to be even better, and even if you're not planning to enter the contest, I think it is still in your best interest as Amstrad CPC aficionado that it is a total success. Well, @TFM , I understand you having such an opinion, and other people thinking similar. However, before acusing, all the pieces have to be taken into account. For instance, Toni had license to use the assets: he asked for permission and got permission from original authors. However, even if he hadn't, contest rules from previous year didn't have a rule for explictly prohibiting the use of third-party assets without license. That was a mistake we made with the rules, and it prevented the jury from taking such action even if the assets were used without a license. I agree that using third party assets without a license should be punished. This year's rules explicitly say that. However, being fair is sometimes very difficult, as many things have to be considered. Is not as easy as agreeing in an opinion. 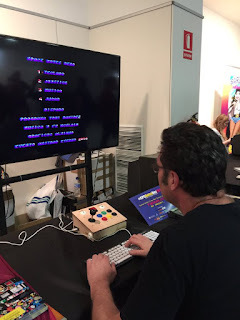 Edit: As a curiosity, in our latest fair "Amstrad Eterno" we saw Víctor Ruiz playing Space Moves and giving feedback to Toni directly, in person. No of course not, theres another game I have just about finished but theres a bug i'm having difficulty tracking down. Ohh how I loved Time Pilot!!! Time Pilot is a Z80 + AY based game. Like Pac-Man, best to do an arcade emulator for it! Do not forget Syx's Pacman emulation! Page created in 0.273 seconds with 105 queries.